A pressure washer can help you get a ton of surfaces clean, most commonly used for cars, decks, and other outdoor items. We’ve done the research to present you with the best commercial pressure washer reviews so that you know which to buy for however you’d like to use it. Each of these washers is amazing in its own right, and your business will thrive! Here are some things you should know. Pressure: The pressure is a value of how fast and hard the water is going to come out of the wand, which will help determine how well the pressure washer will blast away dirt and soap. Hose Length: The length of the hose that you use to wash things is presented here. The longer the hose, the more reach that you have; this is ideal when you’re washing things like cars and trucks. 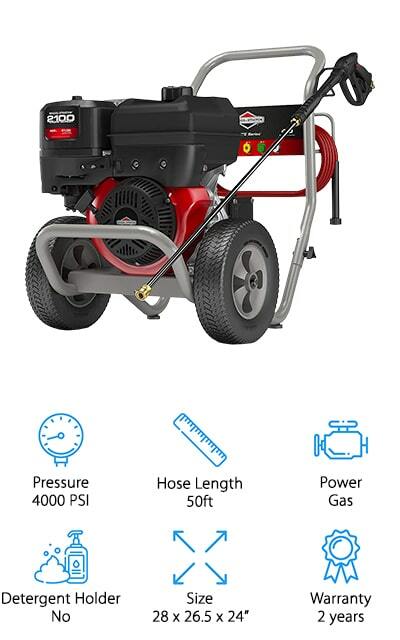 Power: Most of the pressure washers on this list are gas-powered, simply because gas often offers the most power output, and the most consistent. Simply add the fuel and you’re good to start power washing anything. Detergent Holder: A detergent holder, as we mean it here, refers to a tank on the machine that you can pour detergent into, instead of attaching a separate container for your soap or cleaner. We’ll let you know if it has one. Size: The size of the pressure washer can tell you a lot about how you can use it. 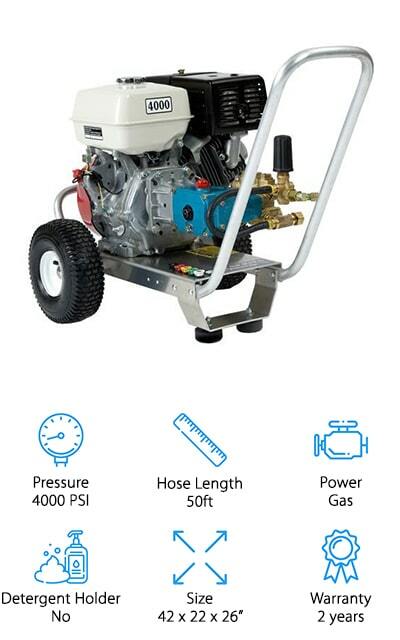 Bigger pressure washers can sometimes put out a lot more power than the smaller ones, due to having a larger engine. Warranty: A warranty means that the company stands behind their products. If it stops functioning within the given time frame, you can get a replacement power washer at no additional cost or hassle. It’s insurance for your purchase! We’ve done a ton of commercial pressure washer review and research to find the top ten pressure washers on the market right now. Each is perfectly suited for commercial and consumer use. The top pick and budget pick are our personal favorites, so check those out first before powering through the rest of the list. We’re sure you’ll find a great pressure washer to suit your needs on our list, so let’s get started! DEWALT is, of course, one of the best-known names in power tools, and this pressure washer is definitely on the top of our list for a reason. It’s powered by a Honda GX390 engine that gives you an alert when the oil is low. It comes with ceramic pistons that will last you a long time and is equipped with a thermal relief valve so it doesn’t get too hot. You can connect the given nozzle tips, in zero, 15, 25, or 40-degree varieties. Detergent is introduced via a detergent siphoning tube that you dip into your own container to get the perfect lather. 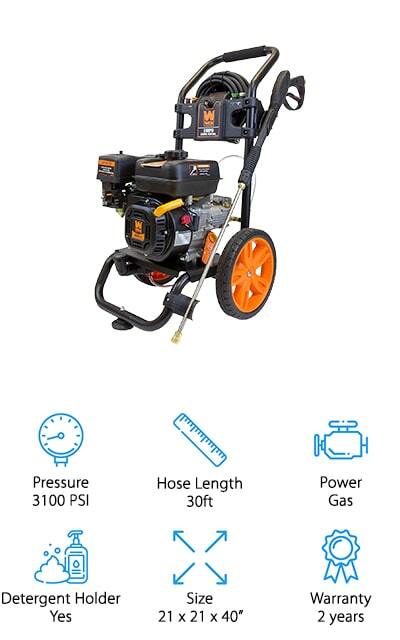 This machine can put out about 4200 psi, so you can definitely power through the dirt and grime on just about any hard surface. It comes with 13-inch pneumatic tires so it’s easy to move around to where you need it. The frame is made of heavy-duty 12-gauge steel. It’s sturdy and dependable! The best commercial pressure washer for the money is this one by WEN. It’s a gas-powered, 208 cc engine that pumps out about 2.5 gallons of water a minute. That equates to about 3100 psi. What makes this pressure washer amazing is the addition of an onboard soap tank that you can keep your detergent in. This adds to the portability of the machine and makes it easier to get the job done. There are five quick connect nozzles included, with four different degrees represented and a special soap nozzle. You get a reliable spray with the Axial pump, and the 12-inch wheels help you move effortlessly over a wide variety of terrain. The hose is 30-feet long and reinforced so it will last you a long time. If you’re looking for a great commercial power washer on a budget, definitely consider the WEN PW31 model. It has everything you need, especially if you’re just starting out! The Simpson commercial pressure washer features here runs on the durable, powerful Honda GX380 engine. It’s also the model that will alert you when the oil level gets low, so it helps to extend the life of your washer. The pump is a CAT Triplex Plunger Pump that’s going to last you forever and deliver consistently high-pressure water. It includes a 50-foot steel-braided hose that can hold up to whatever you throw at it. 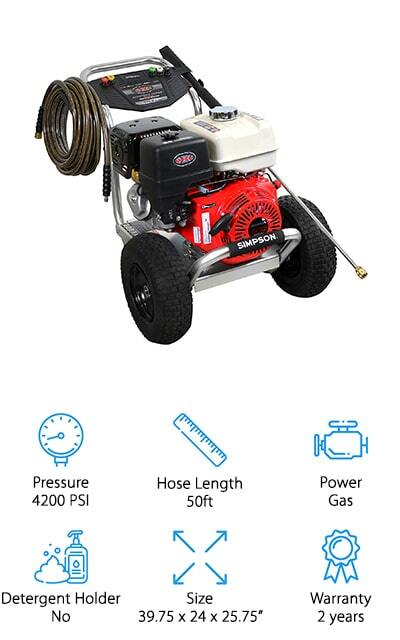 Every piece of this pressure washer is built to last, and that’s exactly what you expect in a top rated commercial pressure washer. It comes with a pro-style spray wand and 5 tips that will help you spray at a variety of angles and apply soap. There is also on-board accessory storage so you never have to worry about losing pieces! Plus, the downstream detergent injection system gives you the ability to put the hose into your detergent jug and apply your favorite cleaner! Excell makes this amazing cold water pressure washer that will help you keep your cars and decks clean. It runs on a 50-state certified 212cc gas engine that Excell manufactures. This puts out an amazing 3100 psi, which is going to be great for cleaning anything you need. Get your siding looking great again and all other types of work! It includes onboard storage for the spray gun and hose, as well as built-in nozzle holders for the five quick-connect nozzle tips that come with the set. These are color-coded so that you can easily switch between them for cleaning multiple different surfaces. 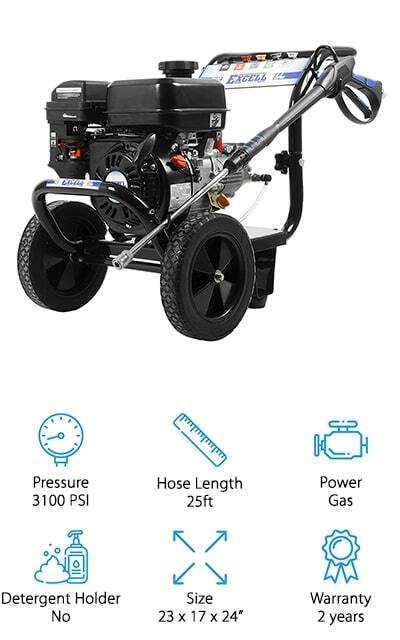 The low-profile frame makes it a great small commercial pressure washer that can still knock some of the bigger ones out of the park. The wand is ergonomic to hold and resistant to rust. You can put it together quickly. The fuel tank for the gas can hold a little less than a gallon. 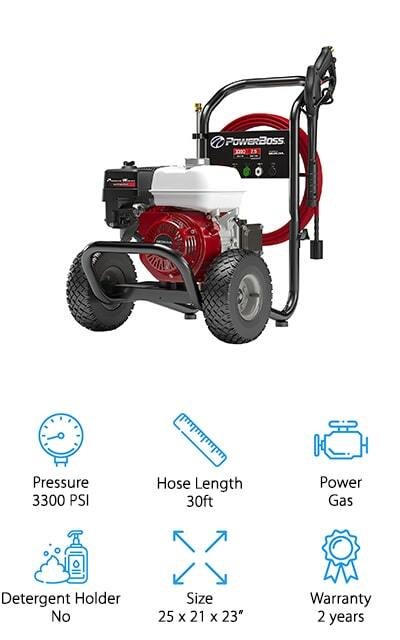 PowerBoss makes this Honda commercial pressure washer, powered by the Honda GX200 engine that gives you a max psi of 3300. That’s about 2.4 gallons of water per minute, which is more than sufficient enough to wash whatever surface you have in mind. It includes a Triplex pump with a pressure regulator that you can adjust so that you can fine-tune the way that the machine works for the job that you have to do. That’s pretty amazing if you ask us. It includes five quick-connect tips, four for angles of 0 to 40 degrees and one that’s specifically for soap. You can siphon the cleaning solution right into your water stream to produce foamy, perfect amounts of soap for whatever job that you need to get done. You can clean your driveway, car, and the sides of your house with ease. The 30-foot hose easily flexes to the angle and position that you need. The STANLEY FATMAX commercial pressure washer is made with a Kohler RH265 engine that makes it easy to start the engine with Easy-Pull technology. 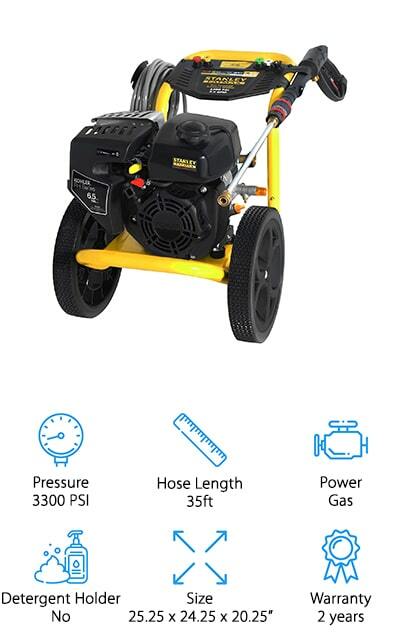 This pressure washer is sturdy and works well for whatever type of job you need it to do – time after time, this machine is going to perform for you. The axial cam pump is maintenance-free and will last you a long time. It’s seated on a powder-coated steel frame that’s welded together and resists any sort of corrosion, even when you’re using the washer with heavy cleaning agents. The wheels are 12-inches high and never go flat, so you’ll be able to easily transport the pressure washer wherever you need it to get the best results. It comes with four different nozzles, three for different angles and one for soap. The flow rate through these nozzles is about 2.4 gallons per minute, more than enough to get some amazing cleaning done. Simpson is back on our list again with their MegaShot pressure washer. This is a less expensive power washer than the other Simpson model that we featured, but it’s great for even the most rigorous and intensive cleaning jobs. It’s powered by a Honda motor that can put out up to 3200 psi, so you can clean every surface effectively. It can even blast away mildew from your outside areas. It comes with a 25-foot flexible pressure hose that’s resistant to kinks and abrasions. It’s lightweight and easy to carry so you can direct the stream of water wherever you need it. It comes with the standard five nozzles, including a soap nozzle so you can blast through any sort of hard grime. There are so many uses for this pressure washer, we’re sure that you’ll find some new amazing use each time you get it out. It comes with 10-inch pneumatic tires to wheel your washer anywhere! This washer by Pressure Pro puts out an amazing 4000 psi, so it can blast just about anything off of your surfaces. It includes a thermos sensor so that the engine doesn’t overheat, and you know when you should shut it off. It’s powered by a strong Honda GX390 engine that you can start quickly, and will run quietly every time. The CAT Triplex Plunger Pump keeps the heat off of the engine and won’t fail you anytime soon. It’s got a professional quality insulated wand assembly that comes with the standard 5 quick connect nozzles, including one for soap. The hose is made of steel and reinforced, reaching 50 feet long so you can get to whatever you need to clean. 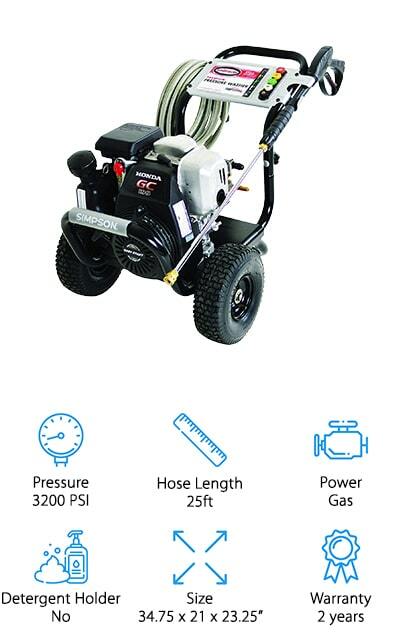 This is an amazingly powerful pressure washer that you’ll enjoy having in your arsenal. It’s CARB Compliant and ready for your private and professional jobs. It works exactly when you need it to, and you’ll love it! Generac makes this SpeedWash Pressure washer that cleans faster than most other pressure washers. There are four different pressure settings, up to 3200 psi. This includes a setting for car washing, wood washing, concrete washing, and a soap setting for getting everything nice and clean. You can easily switch between them with the dial on the spray gun. It includes a few different attachments, including a turbo nozzle for dirt and grim, a soap blaster that shoots soap up to three times farther than the regular nozzle, and a power broom so it cleans a little bit faster. The engine is a 196 cc gas-powered rig that’s manufactured by Generac, so you know that they’re going to back it up. The hose is 30-feet long and is resistant to kinks and abrasions. It also includes three angle nozzles and a soap nozzle tip for the best cleaning results. All of your cleaning tasks will be so much easier! 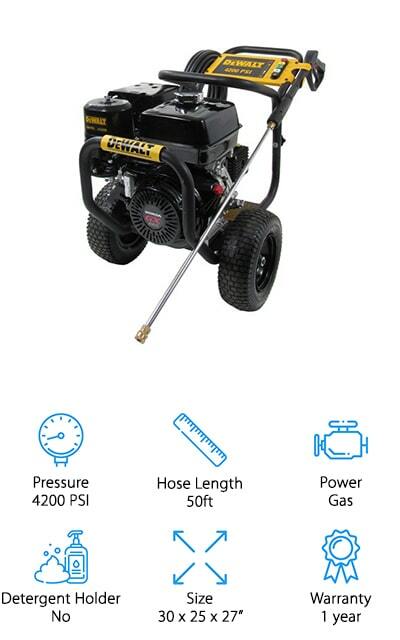 Last on our list is this amazingly powerful pressure washer by Briggs & Stratton. 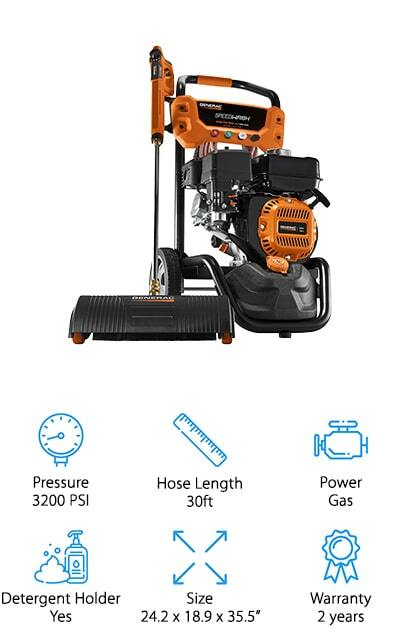 They manufacture their own engines, and this one is a Briggs & Stratton 2100 series gas-powered engine to help you clean all of your outdoor surfaces. It puts out an amazing 4000 max psi, with a maximum of 4 gallons per minute. It can’t be beaten. The fuel tank can hold up to 1.75 gallons of fuel, making this pressure washer a true beast. The five quick connect tips include the regular degree nozzles as well as a soap nozzle, and each of them gives you a predefined spray pattern to help with a certain cleaning task. This means that your cleaning is going to be much more effective. You can reach higher and farther away with an amazing 50-foot hose that can hold up to the high pressure. When you want the pure power to blast through dirt and grime, go with Briggs & Stratton.